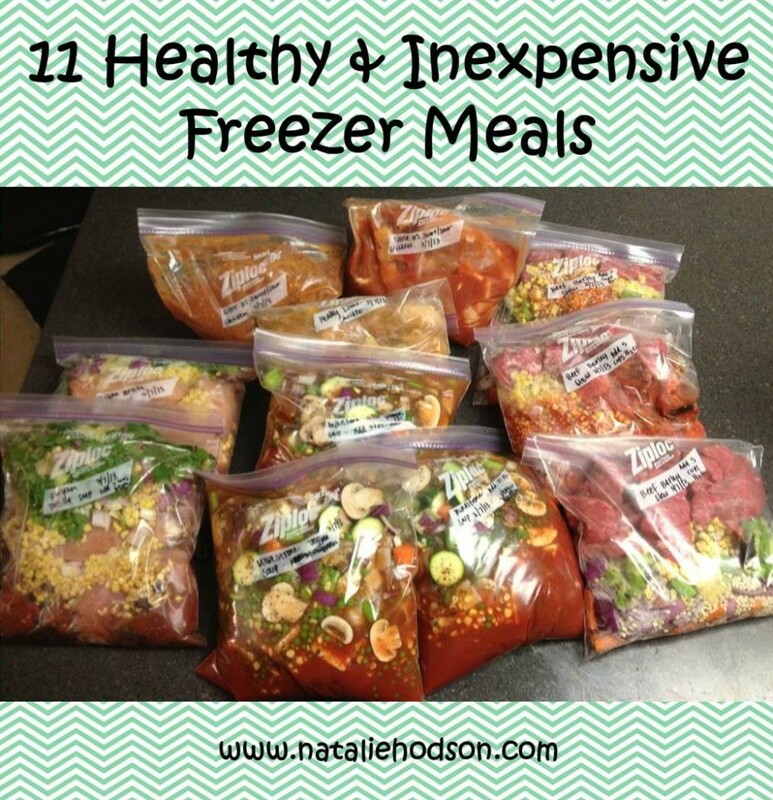 11 Healthy & Inexpensive Freezer Meals! As I am typing this, I am 39 weeks 6 days pregnant with baby #2! I know my time is going to be limited once le bebe gets here, so my goal is to get this posted quickly and share all these recipes with you guys! I remember after baby #1 was born I was so exhausted in the first two weeks that we ended up ordering a lot of pizza, pouring cold cereal, and eating relatively unhealthy simply because I was so tired, sore, emotional, etc that cooking seemed out of the question. I always feel more tired and sluggish when I eat junk food, and it wasn’t helping my recovery. 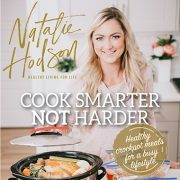 This time around, I wanted to prepare some healthy meals in advance that I can easily stick in a crockpot and have ready for dinner. 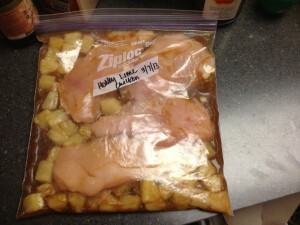 I did a quick search on Pinterest for freezer meals and found a lot of ideas! 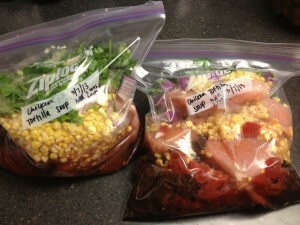 Unfortunately, I had a hard time finding freezer/crockpot meals that were also healthy. Most of the recipes I found included a lot of cream of celery/chicken/mushroom, etc, or BBQ sauces, or ranch dressing, etc. So, instead of using the recipes I found online for “freezer meals” I decided to go visit some of my favorite clean eating websites. 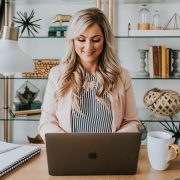 Two of my favorite “go-to” sites for healthy recipes are Little B’s site and The Gracious Pantry (click on each name for links to their sites). Both sites have awesome recipes that I have made many, many times and a lot of times I find myself scrolling their sites for ideas when I have chicken or ground turkey in the fridge but am not sure how I want to prepare it. Below are some pictures I took during the process. So that this post doesn’t end up too long, I am going to put the individual recipes up separately, except for Little B’s and The Gracious Pantry’s recipes. For those two recipes, I will link their sites and you can take a look there to get the recipes. 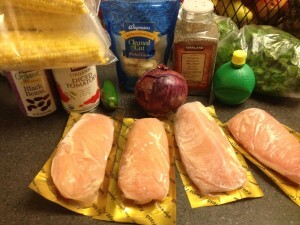 This is one of my favorite “not sure what to make for dinner tonight” recipes! It tastes really good and I usually have all these ingredients in my fridge/cupboard. 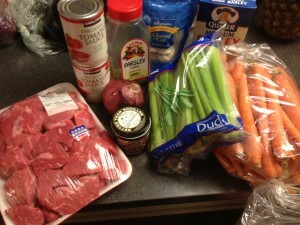 Beef Stew is one of my husband’s favorite meals! When it is cold outside, he asks me to make it for him all the time. Usually I just sort of throw random ingredients together until everything tastes good, but this time I wrote down my ingredients so I could put it in a recipe post for you guys. This soup has a tomato-base to it and the barley makes it nice and thick. If you prefer, you could use potatoes instead of barley. I have tried using sweet potatoes before and those do not taste good in this recipe. Instead, stick with yukon gold or red potatoes cut into bite sized chunks. This is a really simple recipe that I started making last year, but is really tasty! I think I originally found the recipe online somewhere at some point and have changed it up a little and added a few of my own ingredients to make it taste the way I like. When I am really trying to lean down, I am pretty strict about how many grams of sugar I take in each day and might not eat a meal that had honey and pineapple because both are high in natural sugar. But, after the baby comes, that isn’t something I am really watching as closely so this meal is perfect. This is a meal I have made many times and it always turns out so good! My husband and 3-year old really like it too. I followed the exact recipe that is on her site. I didn’t have Truvia packets on hand, but I did have Truvia that they sell in bulk in the little green container and so I just used 1.5 Tbsp Truvia instead of six packets. Also, this meal can be higher in grams of sugar because of the pineapple. Just keep that in mind if you are trying to lean out and watch your grams of sugar. For me, after baby is born, I am not stressing too much about it. Make sure to get pineapple that is packed in juice and not heavy syrup. I used about 1/2 of the juice that was left in the can. To make this into a freezer meal I just put all the ingredients in a gallon-sized freezer ziplock. Make sure to push any extra air out of the bag before you seal to avoid any freezer burn. I trimmed the fat off my chicken breasts and then just put them in whole, but you could also dice the chicken up first (like the recipe calls for). I was just feeling a little lazy and decided that when I cook it I will either cut it after it’s cooked or shred the chicken. 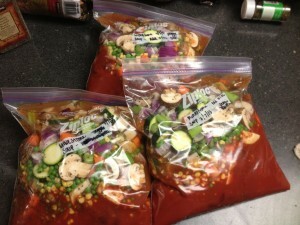 The day before you decide to cook the meal, pull it out of the freezer and let defrost in the fridge for about 24 hours. 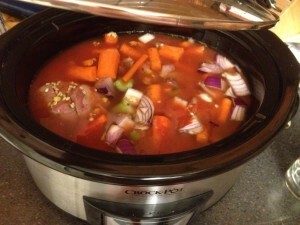 The day you want this for dinner, cook in the crockpot on low for 6-8 hours or high for 3-4 hours. If you haven’t ever visited The Gracious Pantry’s website you are missing out! 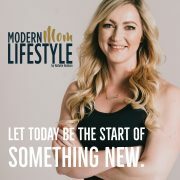 She posts a ton of recipes that are processed food/preservative free and I have yet to try a single recipe on her site that hasn’t been delicious. 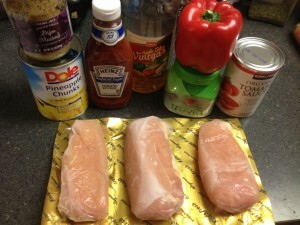 This is how I prepped this meal. There are a ton of veggies in this recipe, so first I got out my ziploc bags (three) and then split each of the different veggies up three ways and just evenly spaced the veggies between each bag. Also, I forgot to get fresh chives and fresh basil so I just used dried chives and dried basil. At first, I wasn’t sure if I would have enough space in my bag for the veggie broth, but turns out I did. So, I wrote on the bag ‘add veggie broth’ but then crossed it out because I had enough room for all the ingredients when I froze everything. Make sure you push out any extra air in your bag to avoid freezer burn. When you are ready to make this meal, pull it out of the freezer the day before and allow to defrost in the fridge. On the day you are ready to cook this meal, you can put it in the crockpot and warm up for a few hours, or put it in a pot on the stove. There isn’t any meat in this recipe so you don’t have to cook it long, just long enough to heat and cook the veggies all the way through. 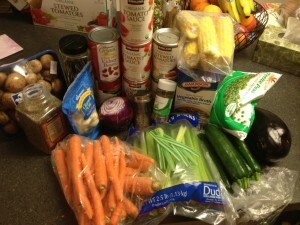 You could add chicken or rice/beans to this soup if you wanted to add more protein to it. 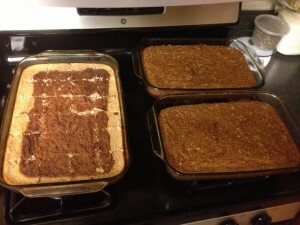 Lastly, I also made a double batch of Jamie Eason’s Cinnamon Swirl Protein Bread and a double batch of her Pumpkin Protein Bars. 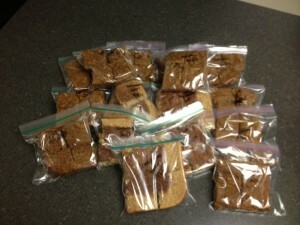 I bagged the bars in portion sizes (4 bars), labeled them, and put them in ziploc bags. These are great to have on hand when you need a quick meal or to curb a craving for an unhealthy snack. I usually keep one in the fridge defrosted, or if I want I will grab a frozen bag, take the bars out of the bag, and put in the microwave for 1 minute. I get asked often if it is ok to use protein powder while you are nursing and/or pregnant. I asked my doctor about this and he said that if I was just using one serving a day and it wasn’t my only source of protein that is was perfectly ok. I try to stay away from protein powders that use artificial sweeteners (splenda aka sucralose, aspartame, etc) or many fillers. The brands I like and use is MRM All Natural Whey Powder . If you have specific questions I recommend talking to your doctor about it. 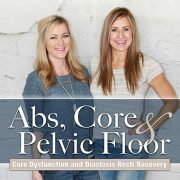 You can also read the blog post I wrote about taking protein powder while pregnant and nursing here. I hope these ideas and suggestions were helpful!! 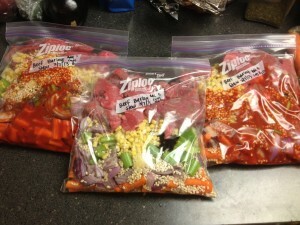 Leave a comment and let me know if you end up making any of these freezer meals and how they turn out! I’m so excited! I guess I just needed the visual. I’ve tried cooking meals in larger portions and freezing half, but it always felt like I was just heating up leftovers. And my cooking pans aren’t really big enough for making that much food. 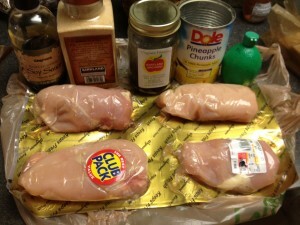 Freezing prepped ingredients on the other hand…..!!!!! I feel like I’ve finally had my “ah ha” kitchen moment! Tonight making chicken soup it was super easy to prep extra, the meat and veges are in the freezer, and I feel like I’m ahead of the game for the next time! 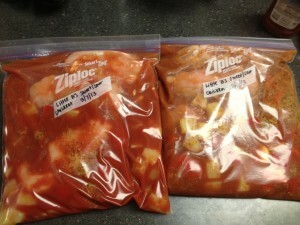 I’m already planning tomorrow’s carne asada and prepping another bag for the freezer! Finally….. I feel like I might get caught up on a few extra minutes each day! Thanks for being so inspiring!